We are all captivated by projects such as the High Line in New York where former industrial spaces are transformed into havens for wildlife. 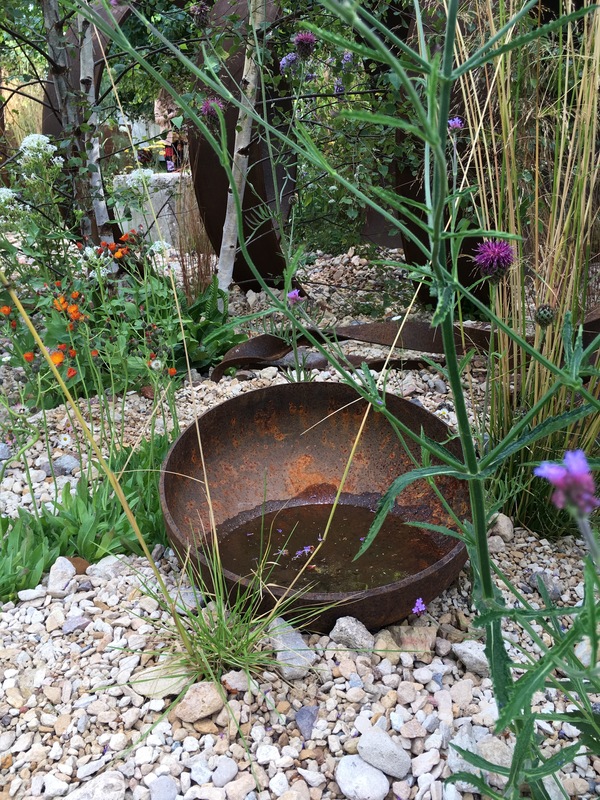 Martyn Wilson’s garden at Hampton Court this year is all about nature taking over. 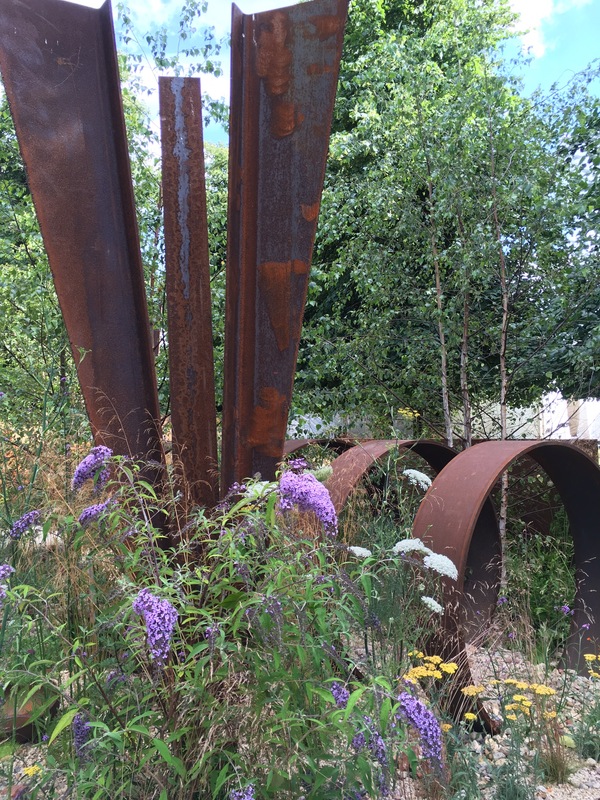 Rubble and decay is replaced by trees and self-seeded plants amongst the rusting monolithic steel structures. 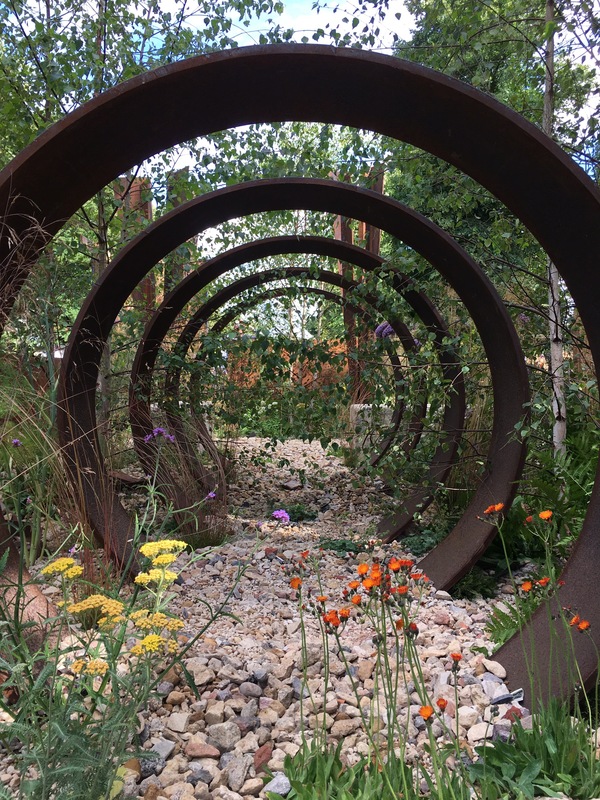 “Inspiration came from places such as the High Line in New York and the Landschaft Park in Druisburg, Germany, and also the regeneration of the former MG Rover site in Longbridge, Birmingham. The High Line is an example of a successful project, turning a derelict brownfield site into a thriving contemporary space. The public is invited into what was a forbidden and dangerous space. In amongst the silver birches – multi-stemmed Betula pendula are Buddleja davidii Wisteria Lane and white-stemmed Rubus cockburnianus. 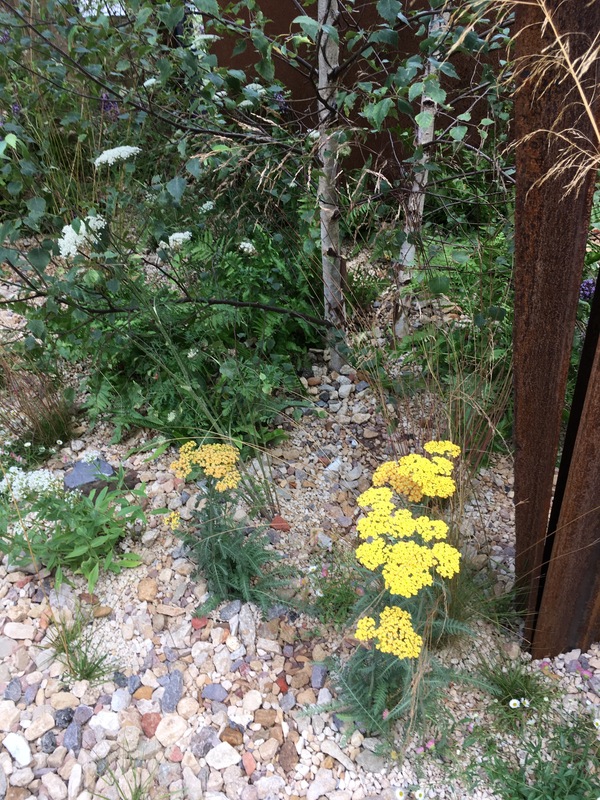 The perennial plant list features golden Achillea Walther Funcke, Terracota and softer yellow moonshine. 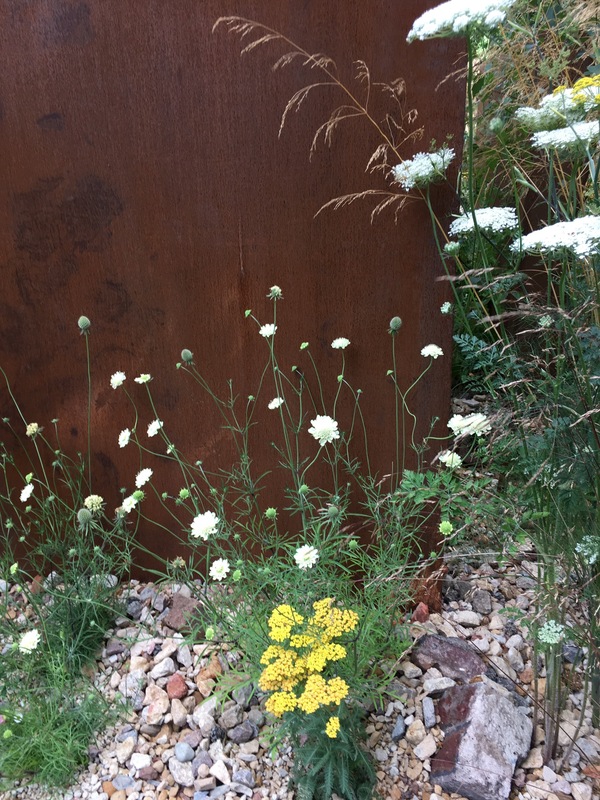 Herbs thyme, fennel and origanum mix in with verbena bonariensis, scabious, leucanthmums and umbellifers. Grasses such as the quaking grass Briza media mingle with Deschampsia cespitosa and flexuosa and Festuca amethystina. Annuals featured in the garden are Dauca carota Dara, Californian poppies, eschscholzia Sun Shades and Red Chief, poppy Peshawar White and albiflora, and poppy rhoeas. 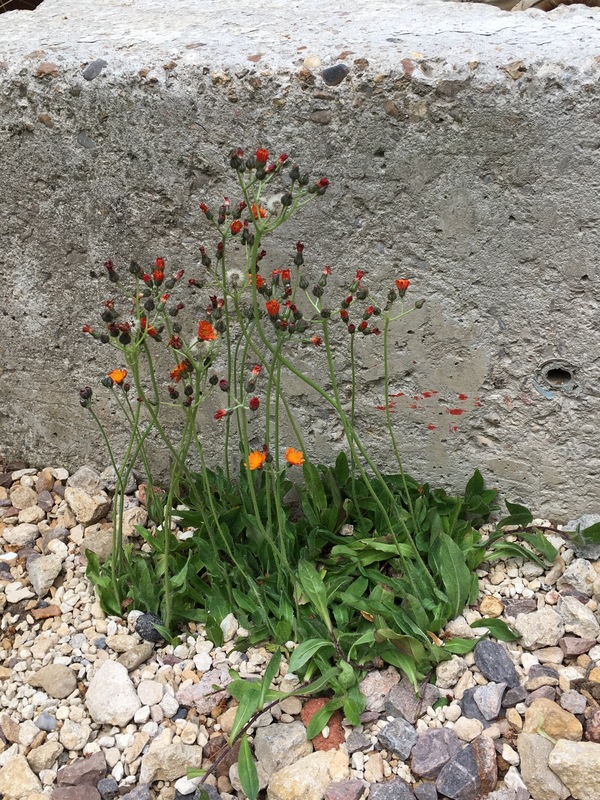 Wild flower orange Hawkweed, Pilosella aurantiaca- also known as fox and cubs- stands out against the crushed concrete scree and monolithic steel structures which were designed by Ledbury-based sculptor Simon Probyn. 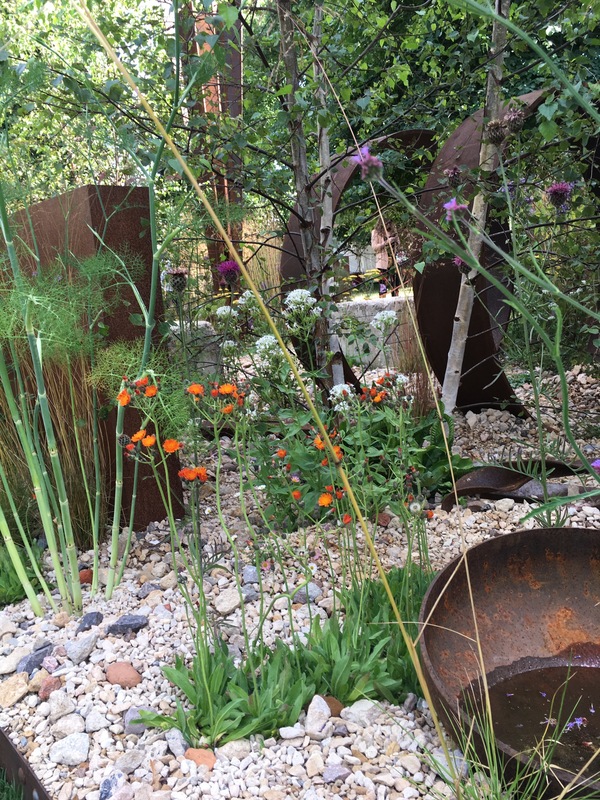 Martyn Wilson’s garden shows a new approach to weaving our industrial heritage into new landscapes for the benefit of wildlife and people. He wants us to see the beauty in these spaces- not just walk on by without a second thought. For me, I understood his “beauty in decay and regeneration,” theme. 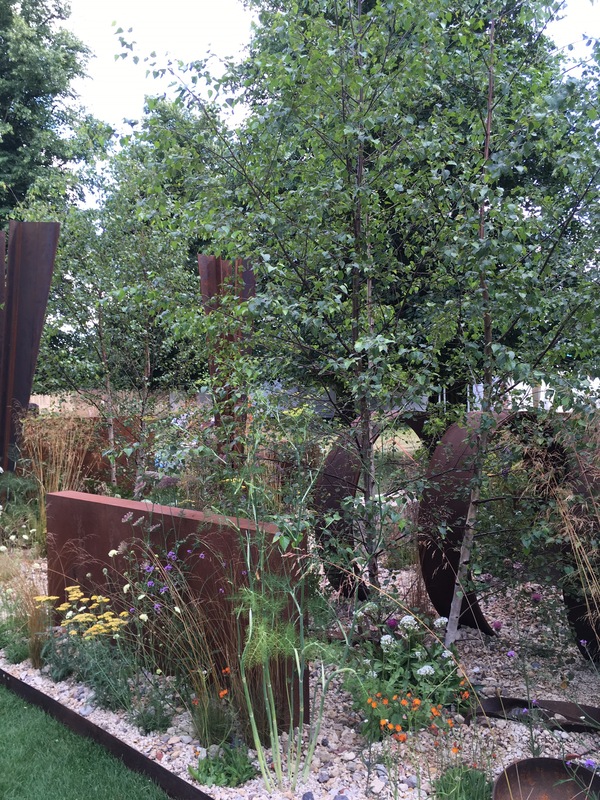 With some show gardens, the ideas behind them can be puzzling to say the least. But this one was obvious. A new approach which celebrates the relics of our past, to create flower-filled spaces for wildlife, insects and people. 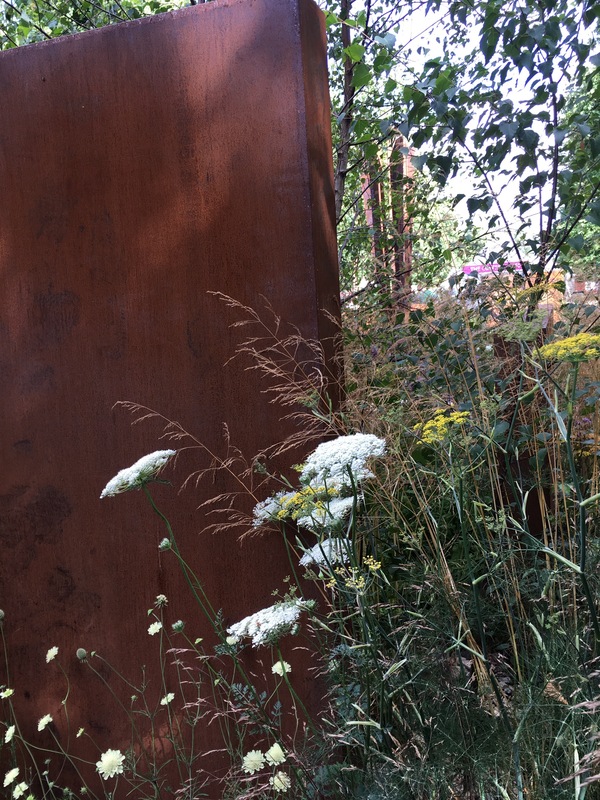 The garden, which was awarded a gold medal, was sponsored by St Modwen Properties PLC and raises awareness for UCARE urology cancer charity www.ucare-oxford.org.uk. If you visited Hampton Court this year, or watched the television coverage, which gardens caught your eye? 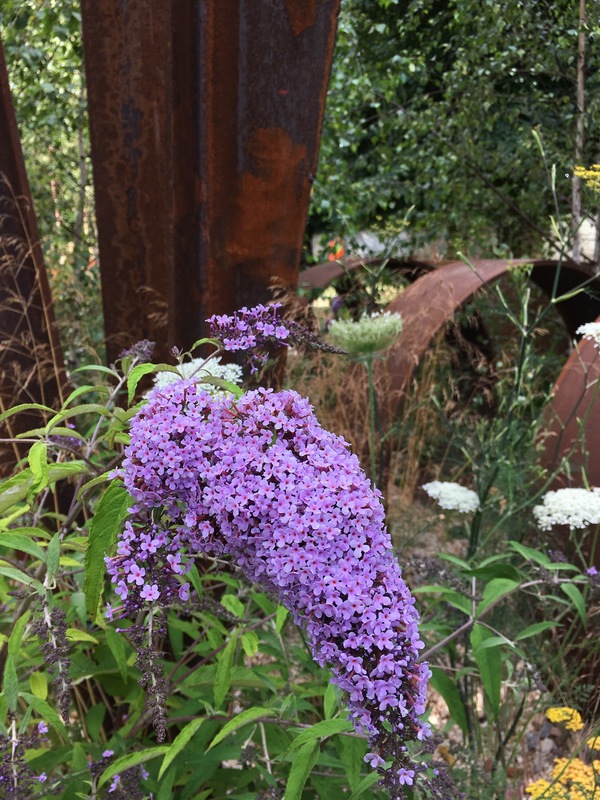 Have any of you visited the High Line garden? It’s on my must-visit list. Thank you for reading, and for taking the time to comment. Amazing effort under “beauty in decay and regeneration” . Nature take over is evident and full of life. Kudos to team who did this. I love this idea! 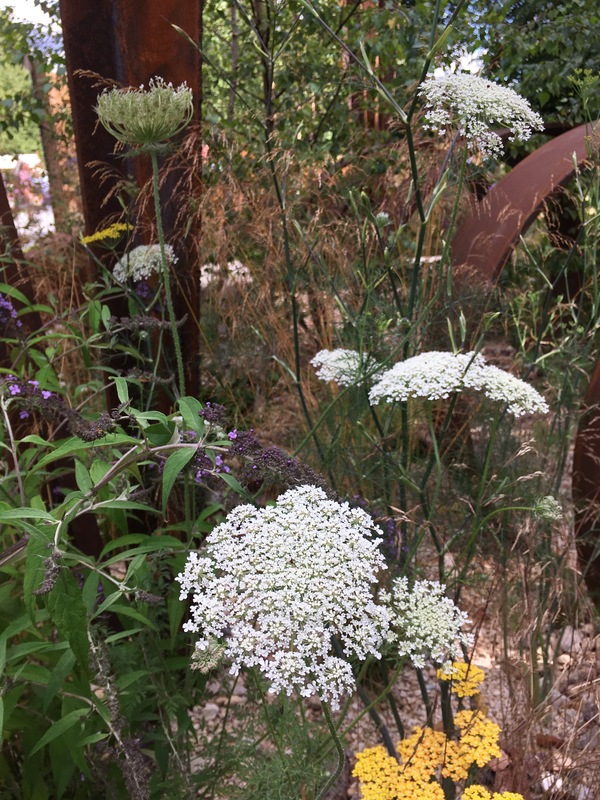 Living in an already summer-dry climate, and anticipating even hotter, drier times to come, I’ve been thinking about gardening with tough, weedy yet attractive plants instead of those that need a lot of watering. And I’ve noticed how plants can form attractive communities in vacant lots, industrial areas, etc. Applying design and aesthetics in these situations can be done just as effectively as in “real” gardens, as shown by the photos in your post. In our town there are a lot of vacant plots just covered with buddleja at the moment. They are full of butterflies. There’s a disused quarry nearby that’s attracting hundreds of visitors right now. Some rare bee eater birds have turned up and are nesting. Read more here http://www.rspb.org.uk/community/ourwork/b/biodiversity/archive/2017/06/26/how-to-see-bee-eaters-in-nottinghamshire.aspx Thank you for reading and for your kind comments, Audrey. You have captured it beautifully. It is quite stunning. I have fox and cubs in my garden but never knew its proper name. Thank you for reading, Bridget. I know the lovely orange flowers from my childhood as fox and cubs. It’s a favourite of mine. Thanks for your kind comments. I really enjoyed the show and this garden was one that I kept going back to. I wish all wastelands were as lovely as this one! Kathy magnificent pictures that illustrate the whole walk through the garden, taking the soul out of the garden. A beautiful garden that well deserves the first prize. I wish all the abandoned urban plots had a garden as beautiful as this one. Thank you very much. Greetings from Margarita. Finally caught up with coverage and saw this one last night – and caught up with your post! I completely agree with you on this garden, Karen, I really like it.